A little over fifty years ago, a generation of visionaries reclaimed overgrown hillsides to plant Pinot noir and other cool-climate grapes, including America’s first Pinot gris. These fearless pioneers intended to put the Willamette Valley on the international map, and they succeeded. Oregon Wine Country produces award winning wine, and while the number of wineries continues to grow, Willamette Valley winemakers haven’t lost their personal, handcrafted approach, or their desire to do things a little differently. Most winemakers in the Willamette Valley practice sustainable winegrowing, a decision rooted in their respect for the land and desire to see future generations continue the winemaking tradition. Nearly half of all Willamette Valley vineyards are certified sustainable, making the Willamette Valley one of the most sustainable wine regions in the world. Learn a little bit about our winemaking history and plan a visit today. Wine is just the beginning. Willamette Valley pioneers are not just blazing the wine trail. 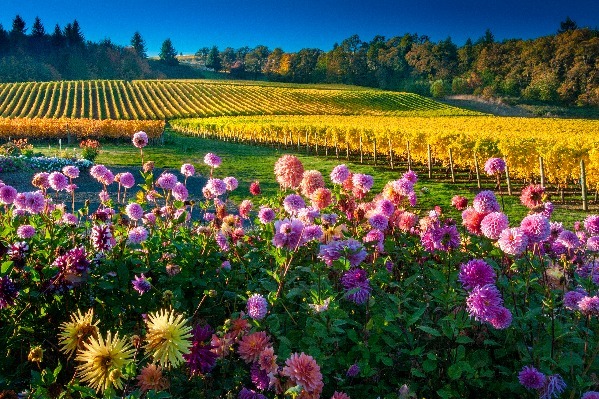 The Willamette Valley offers one of the finest climates in the world --- not only for Pinot noir, but for flowers like roses, dahlias and tulips. Awe-inspiring display gardens delight visitors of all ages all over the region. And don’t just stop to smell the flowers, we have a surprising array of wild edibles, like berries and luscious truffles that can be found and foraged from field to table. Whether you’re looking to pick your own produce at a local farm, take a walk through a scenic covered bridge or view Oregon's Wine Country from the basket of a hot air balloon, this region has something to please everyone. It is truly the valley for all. Learn more about the Willamette Valley and pick from its bounty. There’s one thing that Willamette Valley’s chefs, farmers, and winemakers agree on: the best food and wine starts on a farm. Take this trip through seven fabulous farms. Foodies Unite: The south Willamette Valley abounds in Oregon black and Oregon white truffles. Pick your own fruit, cool down with a sweet treat and meet the growers at these top ten nurseries and orchards.